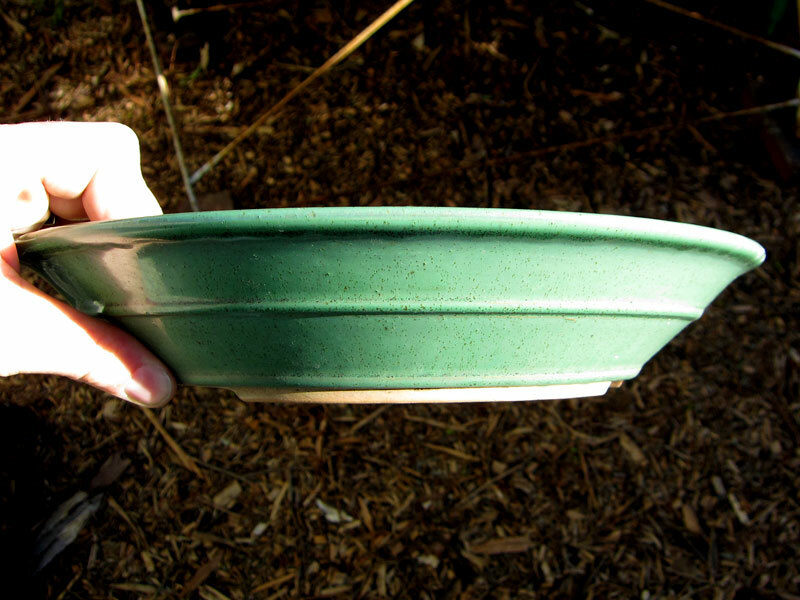 You are currently browsing the tag archive for the ‘Bonsai Pot’ tag. This last weekend I looked through some pots to find something suitable for an english elm clump that I will be re-potting in the coming months. I ended up choosing two pots. Both pots had a number of similarities and I thought that a post comparing them might be interesting. 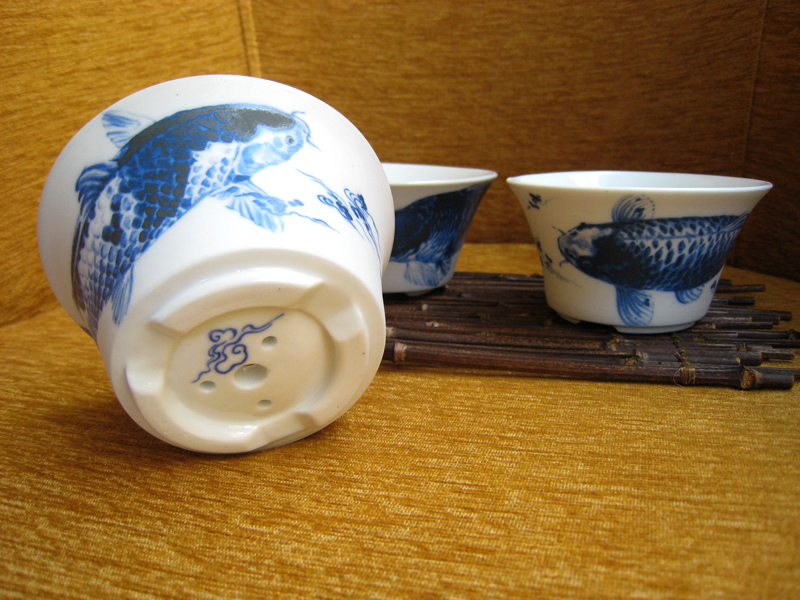 The two pots were made by Yamafusa and Ina Genzou. I really like Yamafusa pots, especially the green glazes. They have a great speckling and richness of colour that varies subtly across the pot. This is a Ina Genzou pot, I don’t know a lot about his work and is the only pot of his that I have. I like the pot but the finish in a few areas seems a little rough in contrast to other areas of the pot which are more visible and have a nicer finish. Both pots were glazed green and both of round shapes, one is a circular shape and the other an oval. The Genzou pot from beneath. Comparing the glazes is interesting. I am always fascinated by the vast differences in similar glazes. 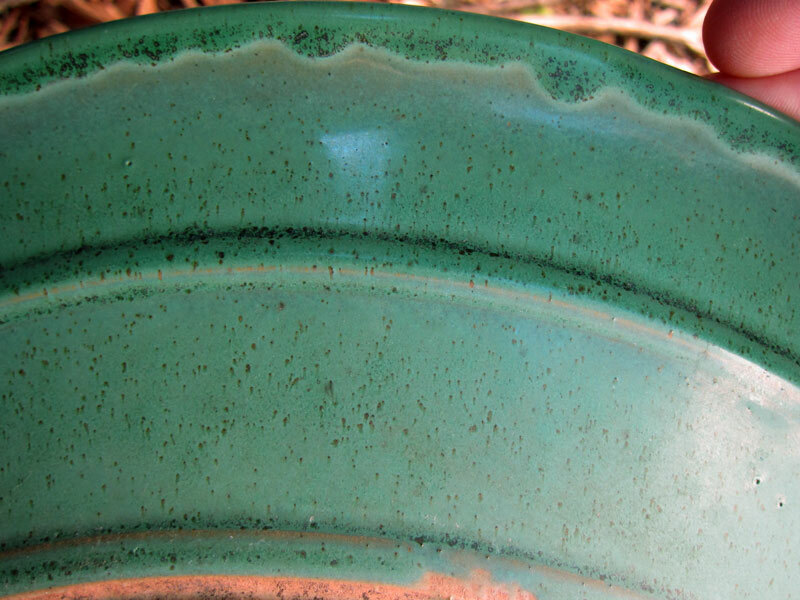 Both pots are green, both have speckles in their glazes yet both are very different. If you look closely at both pots you can see the influence the different clay colours have in the zones where the glaze thins out. I find that Yamafusa’s green glazes really glow. When you look closely you can see that the colour changes depending on its thickness. 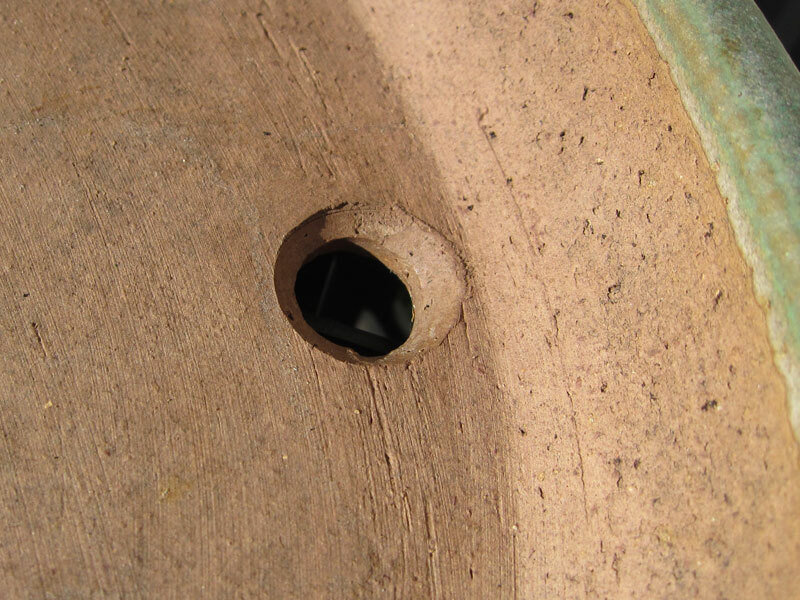 At the top of the pot’s rim, hints of the clay beneath sneak through changing its tone. Ina Genzou’s glaze on the other hand is similar yet has some subtle differences. It seems to have a bit more milkiness to it. It has speckles yet they are smaller and the rim has beautiful drips. Somehow the colour seems slightly duller and more uniform. 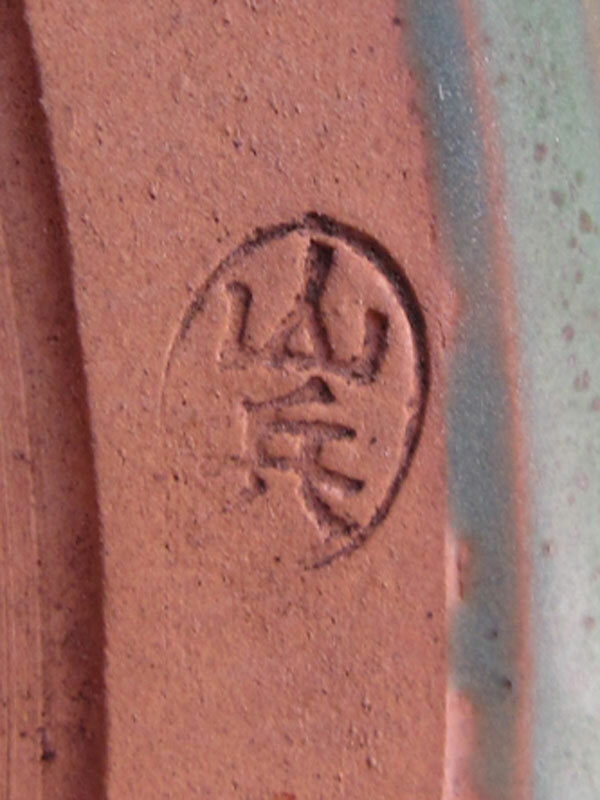 the colour of the clay where is can be seen through the glaze gives a very different colour change to that of the Yamafusa. As you have seen from the previous photos these two pots at least on the surface seem very similar. What sets them apart for me is the smaller details. In fact detail is what really makes the difference for me when it comes to pots. In the next two photos I will look at one area of the pots. The drainage holes. 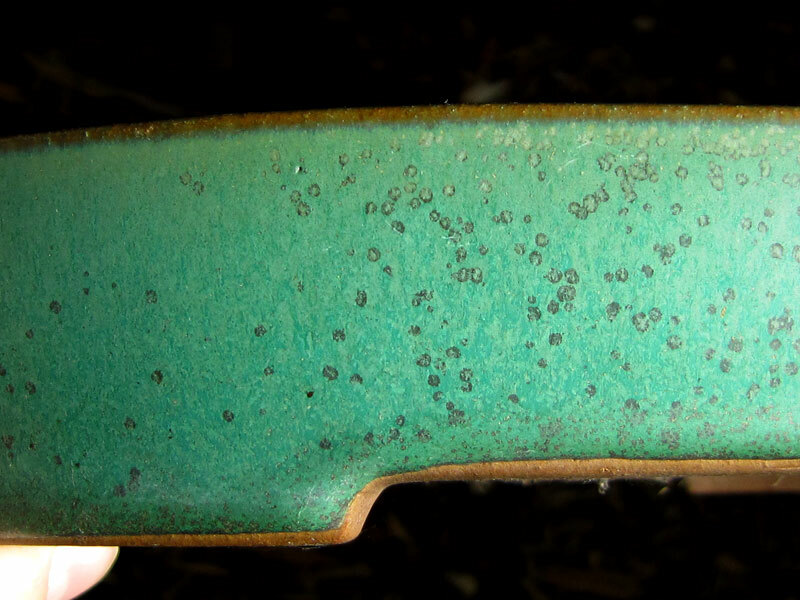 Drainage holes are rarely seen when a bonsai is planted in a pot but when ever I purchase a pot I always try to look at the finish of these areas to determine quality. These details don’t necessarily mean it is a good pot or that it is a bad pot but I think that a pot that has well finished details will often set itself apart. 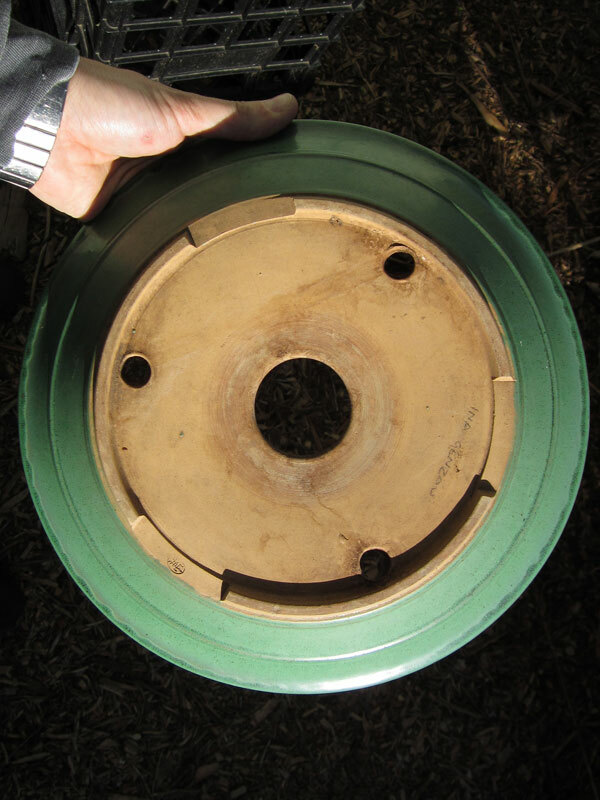 The Yamafusa pot’s drainage holes have been finished with a bevel both inside and out. This makes the holes look well finished and considered. It may seem a small touch but it is the details like this that really show that whom ever made the pot took the time to finish it to a high standard. The Genzou pot’s drainage holes are a little rougher. 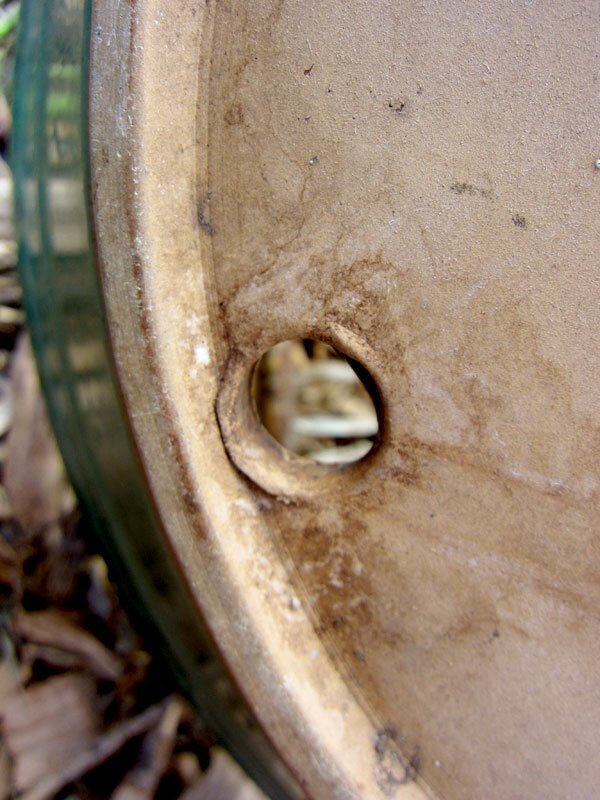 it appears as if they were punched or cut through the pot’s base and then not cleaned up or finished. I am sure they will drain and function just as well as the yamafusa pot but the visual appearance of them looks a less refined. Does this make it a worse pot? Probably not. Both pots will work very well as bonsai containers. 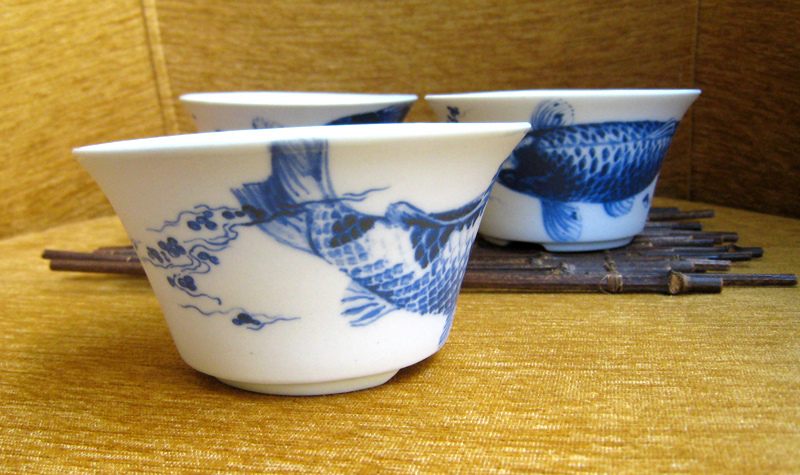 But should you have to choose between two similar pots a detail like this might be the deciding factor. In the case of the elm clump I think I will actually use the Genzou pot due to its added depth but that decision will have to wait for a few more weeks when I begin re-potting. Both pots are from the cheaper end of the spectrum but both have some great qualities that could really add to the image of your bonsai. 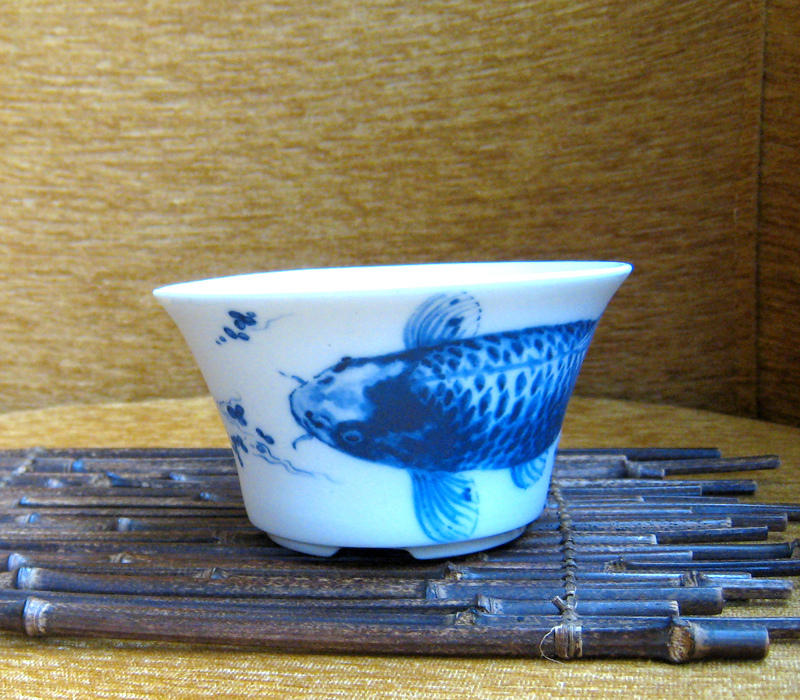 The below pot is one i was generously given as a wedding gift during my last trip to Japan. 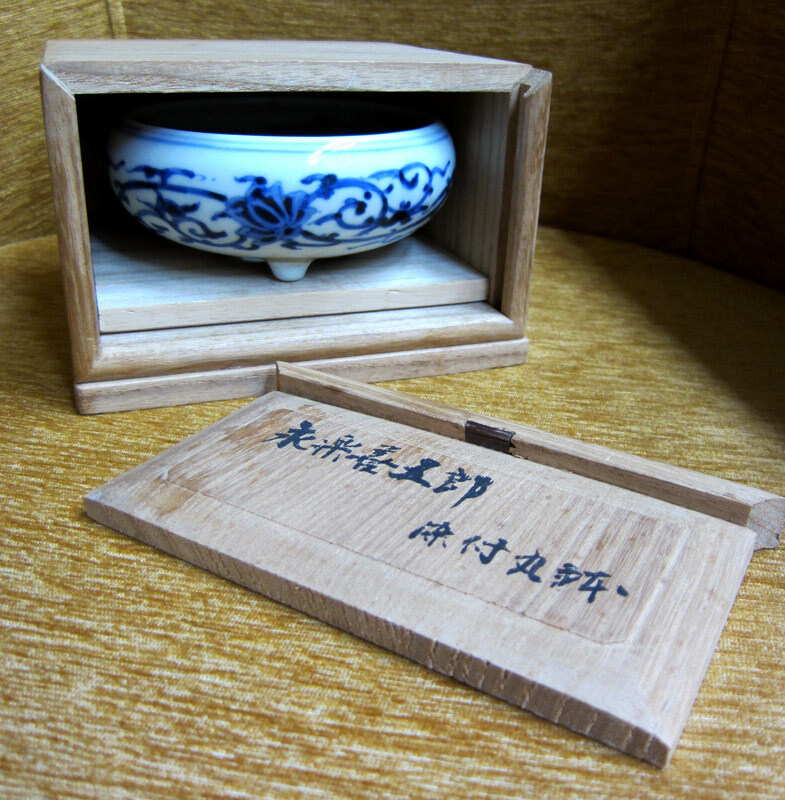 I was presented with a small wooden Kiri wood box with a hand written inscription on the front. 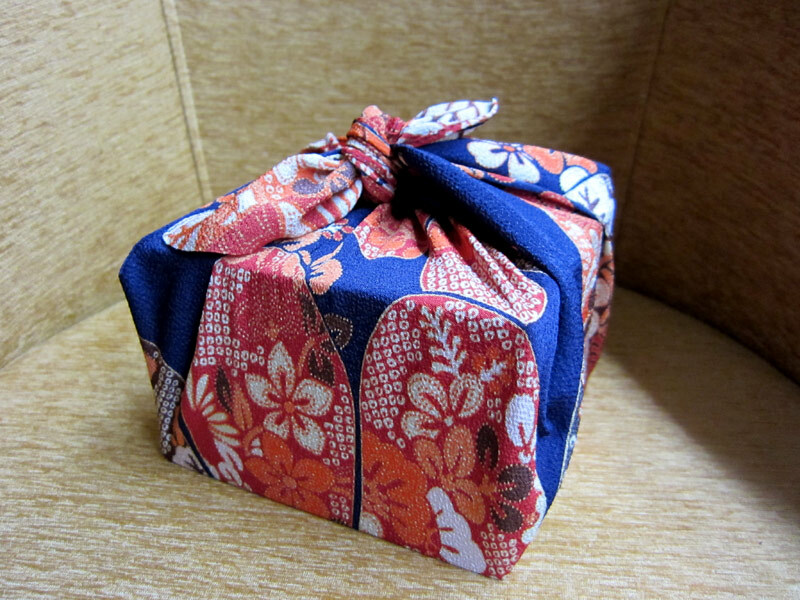 The pot and box wrapped in a furoshiki cloth to protect it during its trip to Australia. Inside was a porcelain pot. I took it out of its box and began to turn it over in my hands. 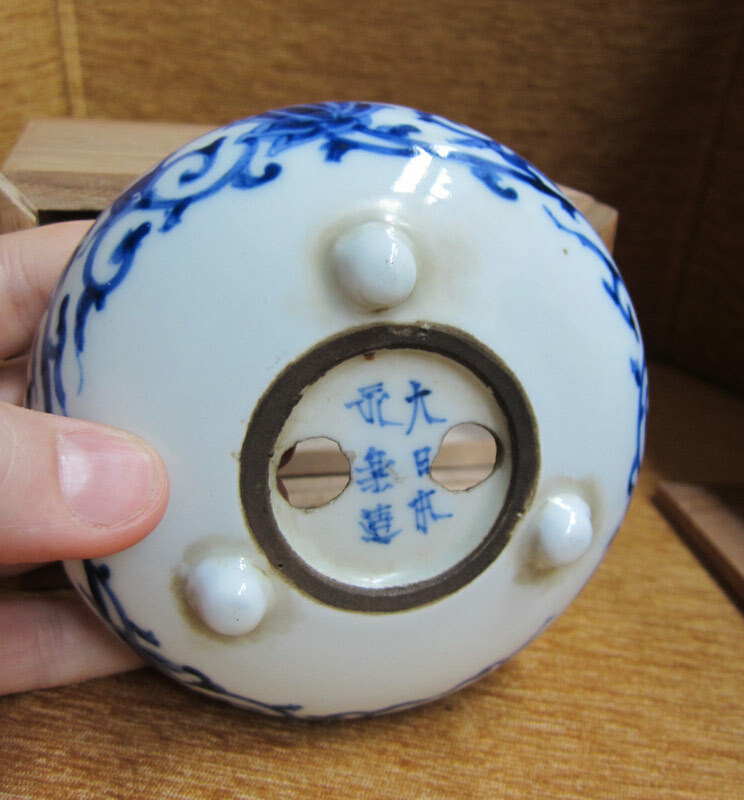 It was clear that it had not begun its life as a bonsai container, but most probably started out as an incense burner. 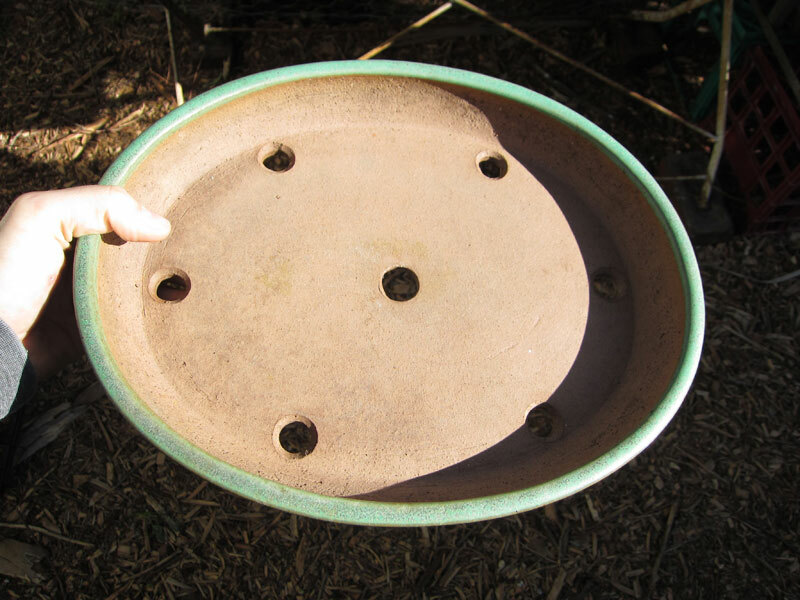 The two drainage holes in the bottom of the pot were definitely done some time after the pot had begun its life. The pot and its Kiri box. 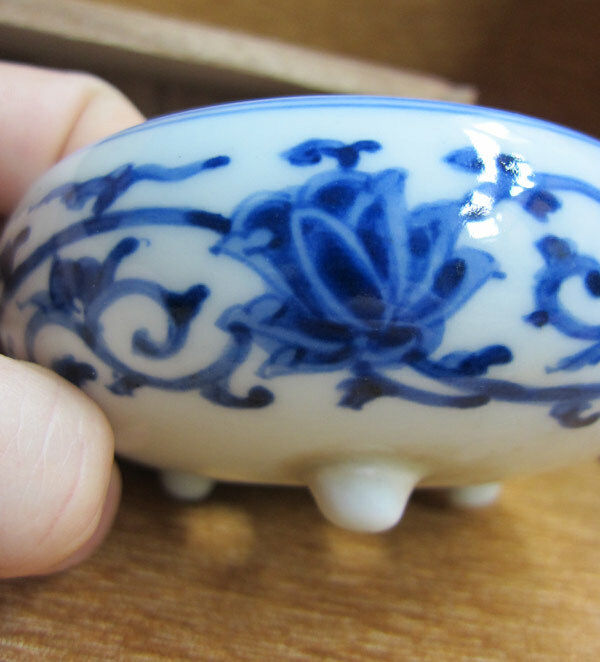 The walls of the pot are extremely fine and the painted design has a free quality to it. A detail of the painted design. I started to do some reasearch on the pot and came up with a website which dates it between 1868-1912. This puts it at around the 100 year old or older mark. The marking on the bottom. 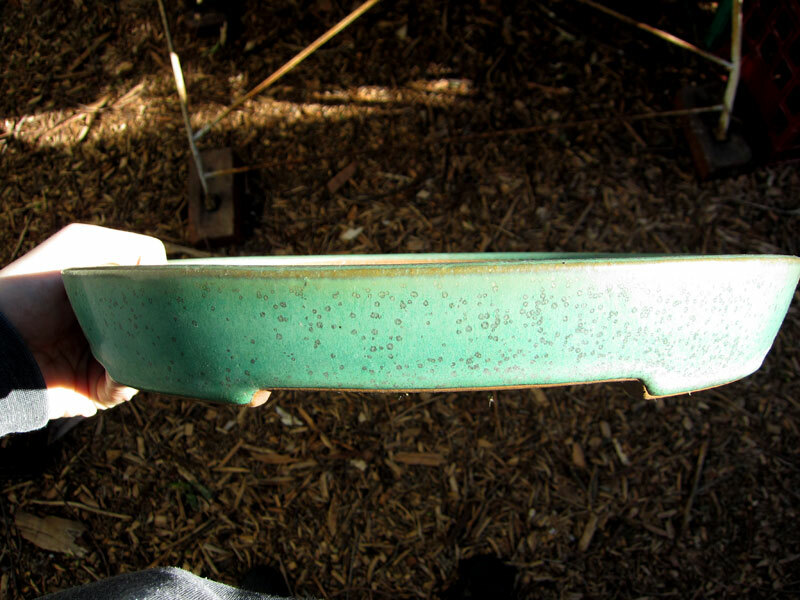 You can see some patina forming which hints to the pots age. The person whom gave me the pot showed me the makers entries in these two books. (ONE, TWO) I have the books at home so i will have to sit down one night and find the entries again and see what information they can add. I feel very lucky to own this pot and it reminds me every time i look at it of the friend who gave it to me. It was a perfect wedding gift (at least for me) and i think it will out last any rice cooker or toaster. I am a Landscape Architect and I am very lucky in that I work with many creative and talented people. 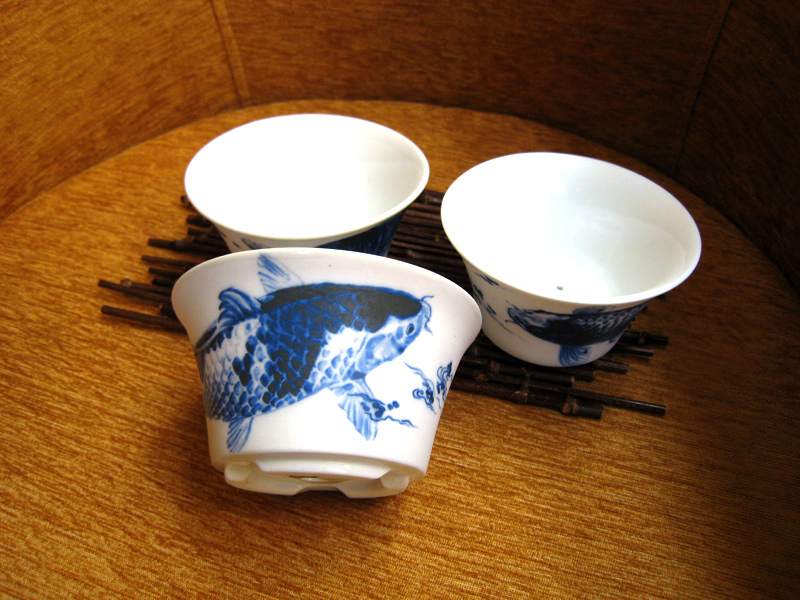 One such colleague makes hand painted porcelain in her spare time. The first time I saw her work I immediately imagined how great it would work as a bonsai pot. The pots shown below are a 3 pot set that i commissioned. 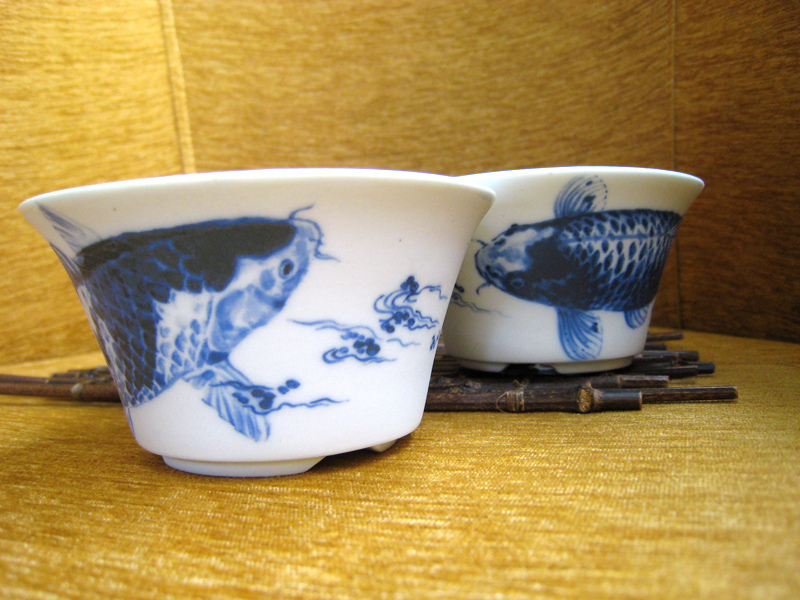 I sent her some pictures that showed the pot shape I was after and then i chose carp motifs that I had seen on some of her other works. When I received the finished products I couldn’t stop smiling. For a first try at bonsai pottery she had hit the nail on the head. They were exactly what I had wanted. 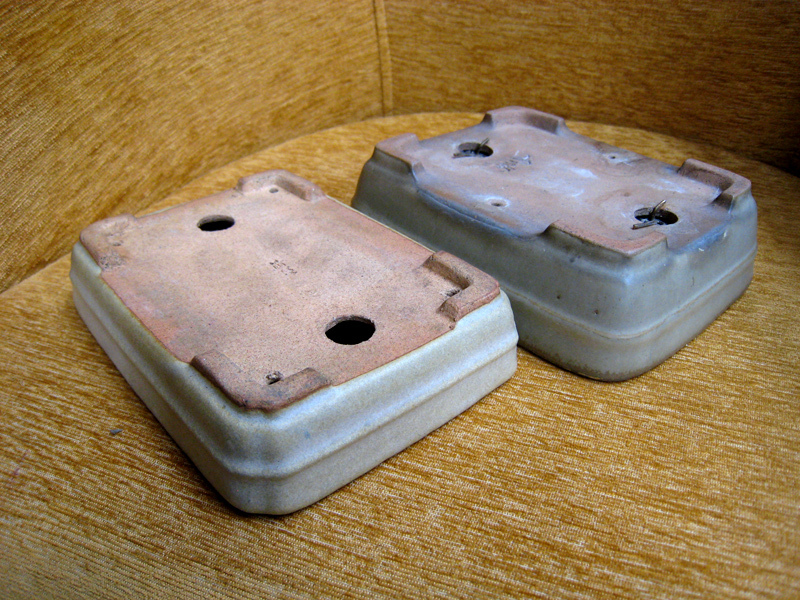 Two pots from the 3 pot set. 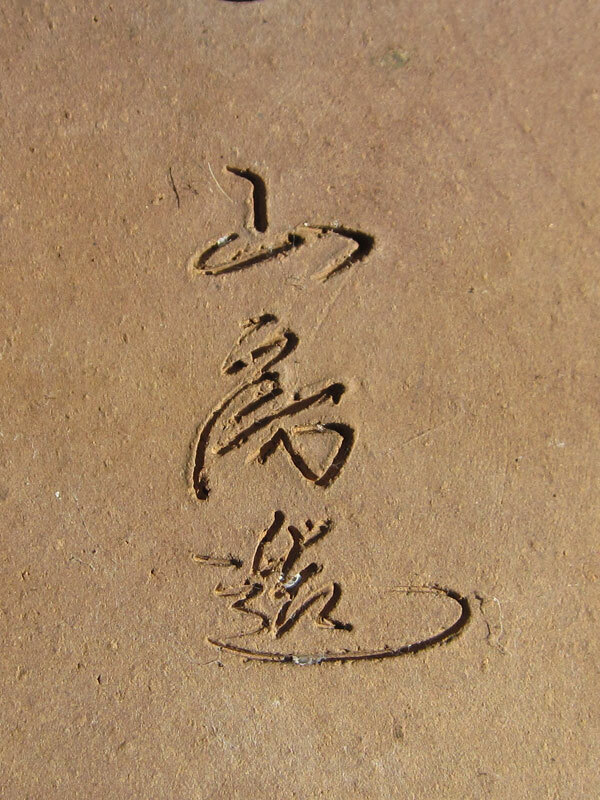 The signature that appears on the base of each pot. The detail in the painting is amazing. I really like how the water has been represented in this pot. These 3 pots are very welcome additions to my collection. Hopefully in the future I can encourage my friend to make some more. The next big decision is what to grow in them. I am thinking a japanese flowering quince may work well. I think that the red flowers of ‘chojubai’ would go very well with these pots. Hopefully I can grow some worthy of the pots.